Example of a fin whale track obtained using the double difference method. Locations are shown by circles color coded by time with the locations prior to applying the double difference method shown as faint gray circles. Also shown are the plate boundary axis (solid line), hydrothermal vent fields (green stars) and ocean bottom seismometers (blue triangles). My group has been by the Office of Naval Research to study fin whales (and blue whales too in our newest grant) in the Northeast Pacific using data from seismic networks that were deployed to study earthquakes. 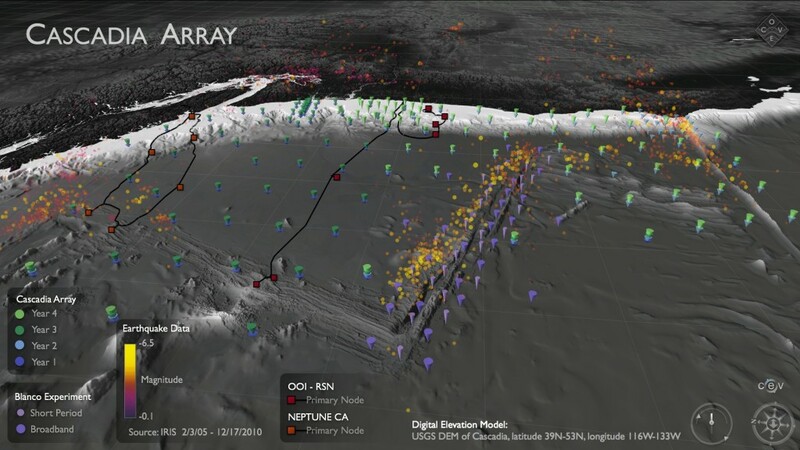 Initially we worked with data from the Keck Endeavour Network (see theEarthquakes at Oceanic Spreading Centers page) that was deployed around several hydrothermal vent fields on the Juan de Fuca ridge. 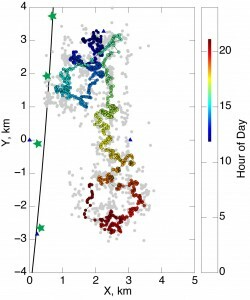 We developed tools to automatically detect and track fin whales using the signals recorded across the network and compiled a data set of ~150 tracks each lasting from 1 hour to nearly a day. 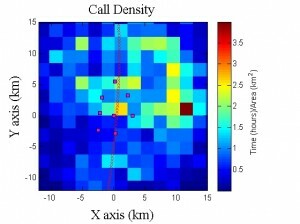 One thing we demonstrated was the use of a location technique call the double difference method to obtain tracks in which nearby calls are located relative to each other with an accuracy of ~20 m (the length of a fin whale). We still need to find a biologist who knows how to make use of such detailed tracks. My graduate student Dax Soule studied seasonal variations in calling patterns – fin whales call from early fall to early Spring and the rhythms of their calling sequences change through the season. Early on the calling patterns are complex and appeared to be generated by groups of whales heading north (a bit of a puzzle because conventional wisdom has whales migrating south to warmer waters in the Fall). Later on the patterns are very repetitive and are believed to be the result of single (and in some instances possibly pairs of) male whales calling during the breeding season. 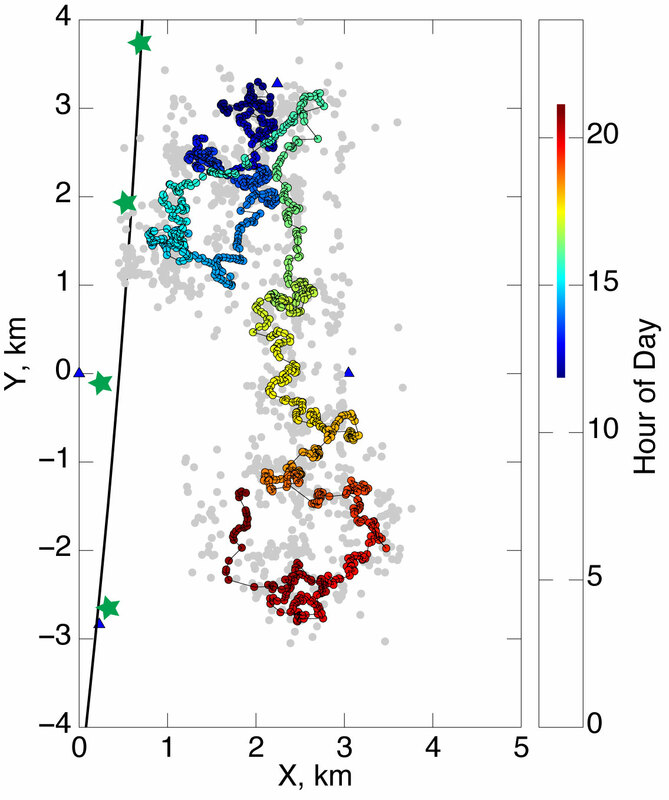 Dax compiled a map of call density around the hydrothermal vent fields that shows that there are more whales above the vent fields and to the east and north east. Interestingly the prevailing oceanic currents run in this direction. 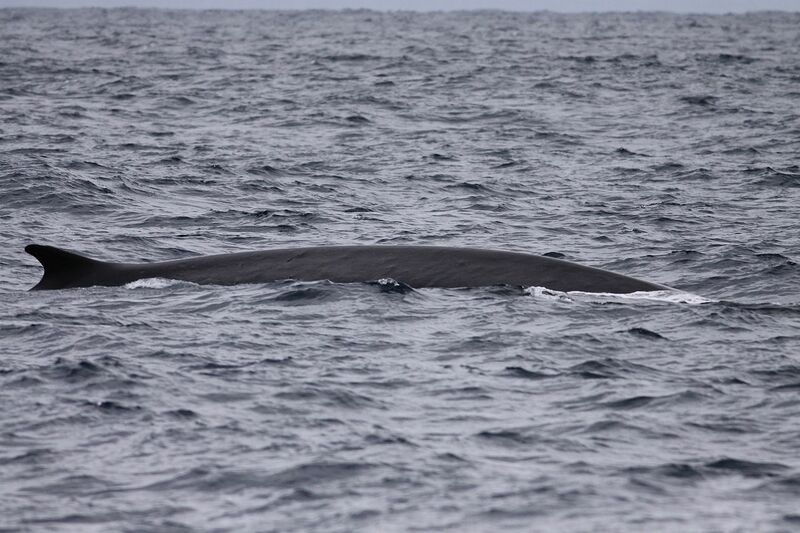 My collaborators Rick Thomson and Brenda Burd at the Institute of Ocean Sciences on Vancouver Island have hypothesized that the fin whales may concentrate in areas where food is enhanced by the presence of hydrothermal vents. Rick Thompson and Brenda Burd have shown that zooplankton concentrations (fin whales eat zooplankton) are enhanced at all depths above the hydrothermal vent fields as a result of zooplankton descending over a mile down in the ocean to graze on hydrothermal plume. These well-fed zooplankton then tend to get swept to the east and northeast by the prevailing oceanic currents. 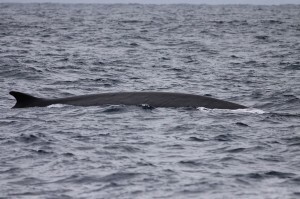 While we cannot prove our hypothesis (doing so would require collecting stool samples from fin whales in the northeast Pacific Ocean in the middle of winter!) our data is consistent with it. 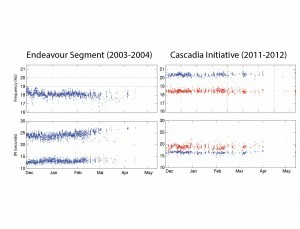 More recently we have started working with seafloor seismometer data from the Cascadia Initiative, a huge 4-year experiment to deploy ocean bottom seismometers on the Juan de Fuca plate and Cascadia subduction zone from 40°N to 50°N. We are really excited by this data set because it will allow investigations of fin and blue whale calling on a scale that starts to approach the distances over which individual whales may roam. 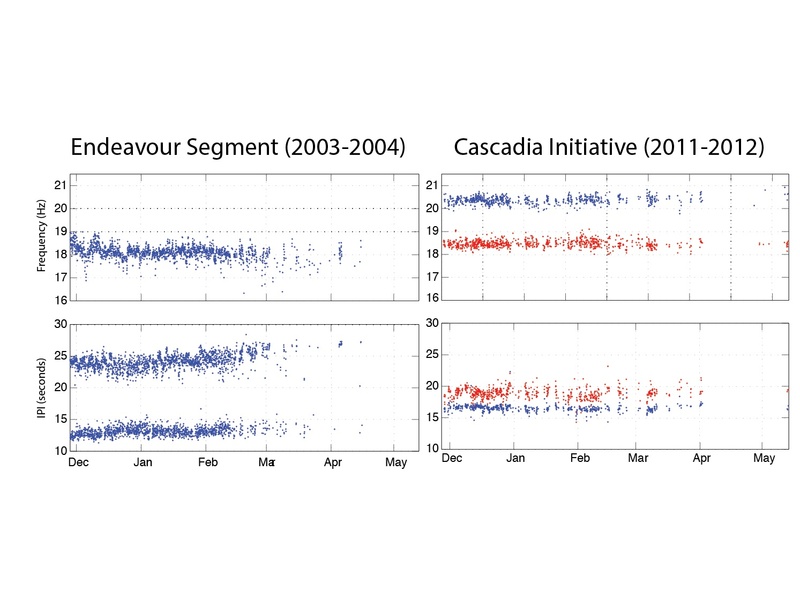 One really interesting observation made by my graduate student Michelle Weirathmueller is that fin whale calling frequencies and patterns have changed substantially in the northeast Pacific over the past decade. We are currently examining more data to understand how and hopefully why?